At age thirteen, in 1960, there was a book at the public library on ‘how to paint’ in watercolour. In those years we lived in Rochester, New York (the home of Eastman Kodak and famous for its Lilac Festival), and ‘art class’ had been a favourite because of Miss Wright. Miss Wright (Cecile) had a long wooden table covered in Mason jars filled with tempera paint of what seemed to be every colour known to humankind. There were those wooden medical tongue depressors in each jar for stirring, and the rank smell of that paint probably still resides somewhere on our persons. In the back room she had dozens of file folders filled with magazine clippings of any subject we wished to study in order to do our work–trees, flowers, mountains, old people, young people, dogs, cats, chipmunks, birds and on and on and on. There was no real structure to that 45 min. period, insofar as we simply went to the back room and retrieved whichever folder was of interest that day and put on our smocks (my father’s old shirt), dribbled our paint selections onto an old plate and went to town. Miss Wright was strict and had her long greying hair wound round tightly atop her nobly-held head, through which she always thrust her pencil. She was strict about a few things, including making sure that if a street lamp or person or fence post were in front of a tree branch, we had to be sure to make the rest of the branch extend beyond the object (“otherwise it looks like the lamp post chopped it off!”, she’d say, grabbing our brush and doing it herself. “See??”). To this day I have always followed this advice. No lamp posts ever chop off branches. In the ‘how to paint’ book were step-by-step instructions of how to do a finished painting, complete with step-by-step illustrations. All I had available were those paints in round pans housed in a black metal rectangle of a box, which every child in America at some point found thrust into a Christmas stocking (not what the book recommended). Beginning with the drawing (not as difficult a subject as the others available), the first task was the sky. It was an absolute fascination discovering how a wetted area would feather into sort-of ‘instant’ clouds. That alone had me sold. Learning from the author that more distant objects required less paint and more water was very helpful. And so was adding more detail as the paper dried, saving the finest detail for when it had dried completely. And the most helpful thing was learning that a single Kleenex solved a lot of problems. What it didn’t teach me was when it was a good time to stop fussing and ‘perfecting’ (another word for ‘ruining’), which I’ve still not quite managed to learn. Leave well enough alone works for a whole RAFT of things, as you say, Cynthia, thank you. Ah, Barry, you of all artists know when to stop because your work is just right. Thank you Rebecca–you inspire me. 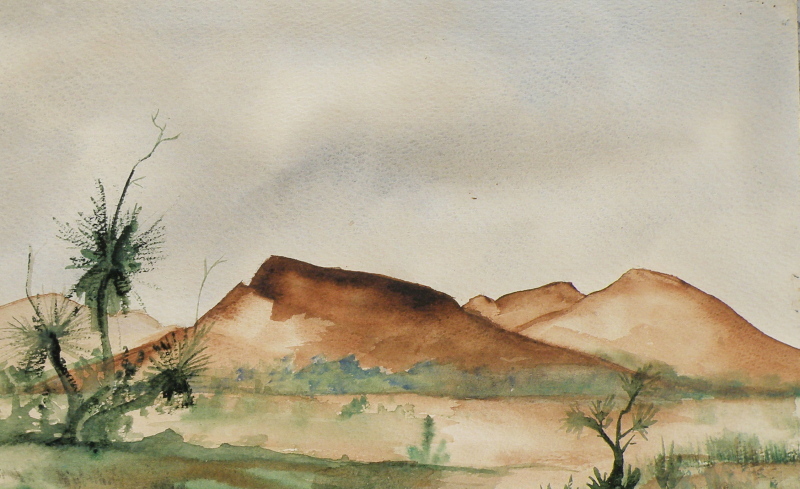 A great life lesson as well as a great watercolor lesson: leave well enough alone…. THANK YOU VICTOR and CHARLIE! It’s a fascinating process. Nice memory. Great story.